The front man for the franchise ownership, Pacific Northwest Sports, Inc. (PNSI), was Dewey Soriano, a former Rainiers pitcher and general manager and former president of the PCL. In an ominous sign of things to come, Soriano had to ask William R. Daley, who had owned the Indians at the time they flirted with Seattle, to underwrite much of the purchase price. In return, Soriano sold Daley 47 percent of the stock, the largest stake in the club. He became chairman of the board while Soriano served as president. However, a couple of factors were beyond the Pilots’ control. 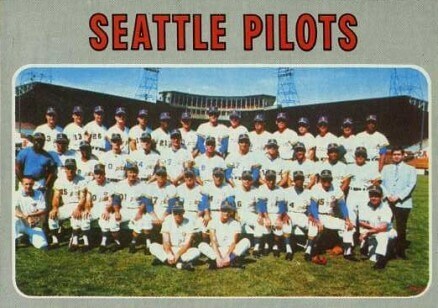 They were originally not set to start play until 1971 along with the Kansas City Royals. However, the date was moved up to 1969 under pressure from Senator Stuart Symington of Missouri. Professional baseball had been played in Kansas City in one form or another from 1883 until the A’s left for Oakland after the 1967 season, and Symington would not accept the prospect of Kansas City having to wait three years for baseball to return. The American League would not allow only one new team to enter the league, as the resulting odd number of teams would unbalance the schedule. That meant Kansas City and Seattle had to be admitted together.